Ages 9-11 years, 3rd through 5th Grades. 3rd grade may overlap with Lower Elementary depending on readiness. Having developed the essential skills of concentration and laid the necessary academic foundation in their Montessori Lower Elementary studies, coupled with the spiritual formation of the Catechesis of the Good Shepherd, the children of the Pre-Grammar School continue in their rigorous pursuit of Truth in the Classical tradition. As is fitting, the children begin their morning with scripture passages, hymns, and the prayers of the Church using the Magnificat. They also listen to the lives of the saints and have a prayer corner for personal prayer. The Latin program is coordinated with the choir about half of whose songs are sung in Latin. These songs are used as a springboard for basic grammar and vocabulary. Short dialogues and dramatic work reinforce this learning. The curriculum of the Pre-Grammar School has its heaviest emphasis on the Language Arts. Because the skills of both competent and artful writing and reading are so essential to the work that follows in the Classical tradition, we have placed the acquisition of these skills as the highest priority. We have carefully designed a curriculum and schedule that seeks to address the needs of each individual child according to his or her level of ability in this area. As such, poetry recitation and memorization, English Grammar 100, the IEW “Phonics Zoo” spelling program, the IEW “Structure & Style” composition program, the IEW “Teaching the Classics” Socratic approach to studying literature, and the performance of classroom plays have been incorporated into the Language Arts program. Mathematics is being taught using the Singapore Math series in a nurturing way that allows for children to work forward or take more time as their needs determine. 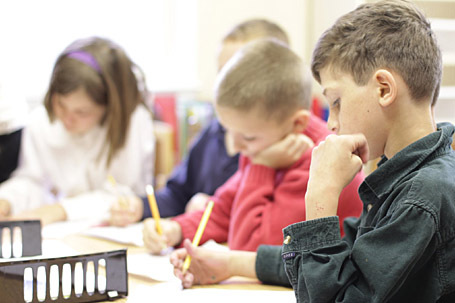 In addition to strengthening the students’ performance of the basic operations of addition, subtraction, multiplication, and division, the children in this group can expect to advance to the Grammar School knowing number lines, story problems, basic geometry, fractions, decimals, negative numbers, simple equations, square roots, exponents, and powers. The study of Classical World History takes its overall three-year cycle structure from Fr. Philip Furlong’s book The Old World and America as the core text. This is supplemented with timeline flash cards, world history charts, and other texts such as Anne Carroll’s Christ the King, Lord of History and Susan Wise Bauer’s The Story of the World, Usborne’s Ancient World, and The Bible for Young Catholics. Each year the children study one of three main areas of world history: Ancient & Classical History (Creation to the Birth of Jesus Christ and the early Christian Church), Medieval History (The Fall of the Roman Empire to the Crusades), and Modern History (The Renaissance to the Foundations of America). Using the Apologia Science series, the Pre-Grammar class follows a three-year rotation studying in turn for one year each: the human body, astronomy, and chemistry & physics. Each lesson offers opportunities for multiple experiments for first-hand observation. Students each have a journal where they can record their observations, take notes from the lecture, do science crossword puzzles, construct paper models, and answer questions from the assigned textbook reading. 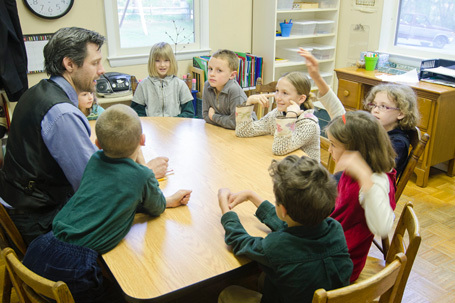 The Catechesis of the Good Shepherd program is both part of and central to the Pre-Grammar School’s overall curriculum. In addition to a dedicated 2 hour Atrium period, students are encouraged to work in the Atrium during their work cycles. All students participate in a variety of age-appropriate subjects in the areas of Fine Arts and Practical Arts. These subjects change and rotate on an annual basis and are taught by professional trade and crafts people. Please see the Enrichment page under the Programs tab on our website for more detailed information. To schedule a visit to the school, or to ask further questions please contact us.